Finishing fourth in the world 800m final has whetted Kyle Langford’s appetite for more success. The 21-year-old believes he can win gold at the IAAF World Championships in Doha in two years’ time and is keen to show his versatility by running for Britain in the 4x400m and 1500m. “Coming fourth here in London might not be the worst thing that has happened to me as it keeps me hungry and I can take massive experience from,” he told AW, as he relaxed at the British House at the London Docklands the morning after his breakthrough performance in the Olympic Stadium. Langford believes he “has the wheels” to be part of the GB 4x400m relay squad. In addition he is keen to step up to 1500m and start tackling championship middle-distance doubles in future, while at 800m he feels his PB of 1:45.25, which he ran in the World Championships final on Tuesday, doesn’t do him justice. Full of excitement after his fourth place in the world final in London, Langford barely slept all night after his race but he was frustrated not to nick a medal. His race strategy was to pick people off in the home straight “like a sniper”, he says, but he left himself with too much to do and was still in last place with 120m to go before beginning his charge for the line. “I wanted to be a bit higher up with 200m to go,” he said. “I wasn’t worried about running a PB but I thought there was a medal there for the taking. The 800m is known for being the hardest to get to the final in but one of the easiest to win a medal. Making the final is tough but once you’re there you have a real chance. It’s very tactical and there are only eight people compared to more in the longer races. So my mentality was that anything can happen once I’m in the final. 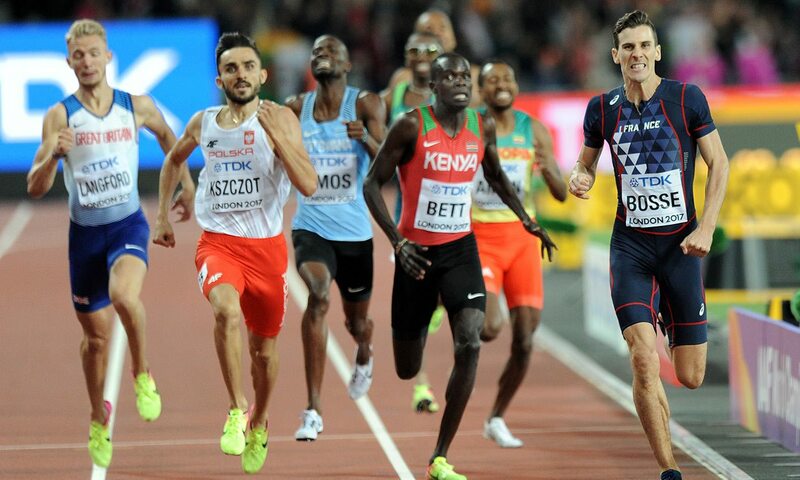 It was the best British performance in the men’s 800m at the IAAF World Championships since Curtis Robb finished fourth in Stuttgart in 1993. But Langford believes he can go one better by making the podium next time. He also feels he had the ability to finish in a similar position at the Rio Olympics if a knee injury during the 2015-16 winter had not wrecked his preparations. A prodigious teenage talent, Langford won the European junior 800m title in 2015 and took bronze at the 2013 IAAF World Youth Championships in Donetsk in a memorable race that saw Alfred Kipketer of Kenya blast through the first lap in 48.63 seconds. On that day Langford also picked his rivals off with sniper-like precision and ruthlessness in the final 200m to win a medal. That baptism of a fire at a global under-18 championships put him in good stead, too, as the mere 51.52 in London this week must have felt pedestrian in comparison. On his London race, which was won by Pierre-Abroise Boss of France in 1:44.67, the Briton said: “When I got to the home straight I was counting how many people there were and I knew I’d at least get fourth – I was 100% sure of that – and as I saw the Kenyan going to die, I thought ‘I can have him for dinner here’ and I dipped and kind of knew I’d missed a medal and I smiled and thought ‘oh well, I gave it a good go’. There will be a lasting tribute to his fine run at the 2017 World Championships, though. A framed photograph of the race is certain to go on the wall in the family fish and chip shop in Watford and, if he keeps improving, there might be a global gold medal to hang up there one day, too.